In the first printing of my Whizbang Cider plan book (and in this online photo-essay) I tell how to press cider by lining the wood-slat pressing tub with a pressing-cloth bag, then filling the bag with layers of apple mash separated by pressing discs. That technique certainly works, but it does not work nearly as well as the technique I'm going to show and tell you about here. This "new" technique is something I discovered after first printing the plan book. 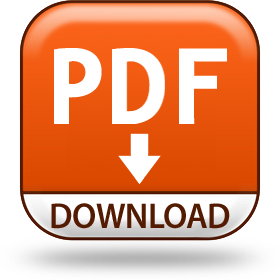 So those of you who have first-printing copies may not be aware of this. And those with second printing copies of the book will find what follows is discussed in the back, on pages 44 to 46. 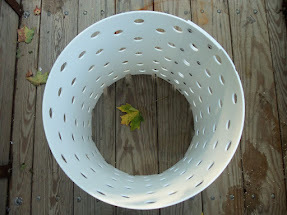 I also want to make it clear that the following method for pressing cider with the Whizbang press is the only one I recommend if you are using a wood-slat tub made with HDPE tub hoops, or if you are using the HDPE pressing tub that I tell all about At This Link. It so happens that the traditional approach to pressing cider is to make a stack consisting of several layers of cloth-wrapped apple mash separated by hard racks (typically made of wood slats). Such a stack is known as a "cheese" or a "rack-and-cloth" press. Pressure is applied to the cheese and the juice flows. Most commercial cider presses employ some form of rack-and-cloth press. 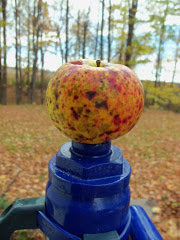 To my knowledge, there are no home-scale cider presses on the market that utilize this old-style pressing technique. The reason they don't use it is because assembling the cheese requires some skill. 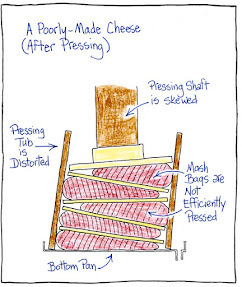 If not made just so—especially with a small press—the cheese will tilt out of alignment as the pressure is put to it. 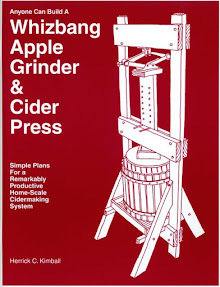 I know this because I experimented with cheese pressing years back and I soon concluded that it was not efficient or practical for small cider presses. However, I now know that I came to that conclusion much too soon. 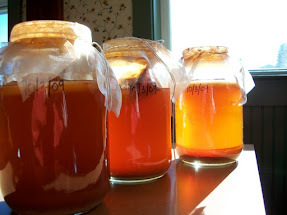 I revisited the rack-and-cloth approach after a very discouraging cidermaking session. The apples I was using were not suited to making cider. I don't mean their flavor was bad. I mean the apples themselves, once ground to a mash, did not press out like I had always experienced in the past. The apples (of an unknown variety) would not release much juice, no matter how much pressure I put to them. And in the process of putting far more hydraulic-jack pressure to the tub of mash than I had ever used before, I actually stretched the HDPE hoops. So I was forced to rethink my cider-pressing technique. And, after some further experimentation, I came to the realization that a traditional rack-and-cloth cheese, if made properly, inside the pressing tub, not only works just fine, it actually works better (Far better!) 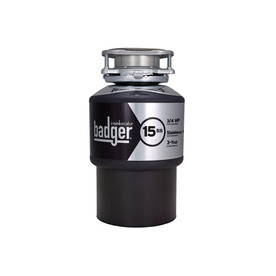 than just filling the tub with a mass of mash and putting pressure to it. Beyond that, rack-and-cloth pressing with the Whizbang press does not require a drain rack in the bottom of the drain pan. It also doesn't require that you purchase a pressing bag (as I'll explain shortly) And it solves the problem of too much pressure on the HDPE tub hoops. There is hardly any outward pressure on the tub when pressing a cheese as I'm about to show you. As far as I know, my new/old rack-and-cloth-in-tub pressing technique is something unique in the world of tub pressing—no other home-scale cider press out there recommends this approach. But they should. That said, if you happen to own one of those tub presses, it behooves you to make some pressing discs (the equivalent of racks) and say good-bye to cidermaking inefficiency. 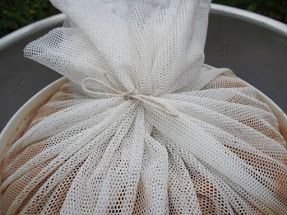 Instead of a single fruit-pressing bag you will need several pieces of pressing cloth for rack-and-cloth-in-tub pressing. You can use inexpensive sheer-nylon curtain fabric for your cloth. The picture above shows pressing-bag fabric on the bottom. The pink colored fabric above it is nylon sheer-curtain fabric that I paid two dollars a yard for at a local fabric store. Above the pink material is a piece of white sheer-curtain fabric that my wife, Marlene, bought at a yard sale years ago. My approach to making the cloth-wrapped layers of the cheese is to lay a 30” by 30” piece of pressing fabric over a form, then pour the apple mash into the form, and simply tie it together with a piece of string. I will show you lots of pictures of this shortly, but first I’ll tell you how to make the form out of a common 5-gallon plastic pail. The picture above shows how I marked the pail for cutting. The Sharpie marker is resting on two pieces of scrap 2x4 lumber, which are resting on my workbench. Simply bring the pail up to the marker and spin it around. The line will be a touch over 3” high. Cut on the line with a jigsaw. Sand away any roughness. The resulting form is perfectly sized for making “apple mash bags” for the Whizbang cider press. The above picture shows the mash form inside a large bowl. In this next picture I have placed a filter cloth (in this instance I'm using sheer nylon fabric) over the form and am pouring apple mash in. Next, I have gathered the fabric together and am tying it with a piece of string. The first bag of mash goes into the bottom of the tub, as shown in this next photo. Please note that this first bag of mash (the bottom of the cheese stack) is placed directly on the bottom of the bottom pan—I have not used a drain rack (as shown in the book and other Whizbang cidermaking essays on the internet). I see no need for the rack with the cheese. When pressing a tub full of mash, the rack helps the juice drain out of the large mass, but it is totally unnecessary with individual bags of mash. A round HDPE pressing plate is placed on the bag of mash. This plate is now a Whizbang rack plate in the rack-and-cloth structure. In the above picture I filled the form right to the rim and weighed it. I found the form holds about nine pounds of ground apples. Again, I gathered the material and tied it off with a piece of string. Notice in this next picture how juicy the mash is in the form. It’s a beautiful thing. 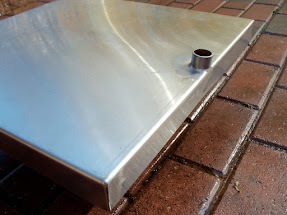 Another round rack plate was placed on top of the bag. For these photos I pressed only half a bushel of apples and had only enough mash left to make a smaller third bag. After that was in place I put the Whizbang pressure plate on top. The 2-1/3 bags of mash did not fill up the Whizbang tub. With four pressing plates (the number I recommend in the book and sell elsewhere on this site) the wood-slat pressing tub will accommodate five mash bags, amounting to a bushel of apples. Here's a picture of the sweet cider flowing under 6-ton-hydraulic-jack pressure. The cider ran out of the mash bags very quickly. More quickly than is the case when pressing a fabric-lined tub full of mash, even with the pressure plates layered in the mash. In no time flat the cheese with its individual cloth-wrapped bags of mash was pressurized to the point that very little cider flowed any more. As for the wood-slat tub, it had so little pressure on it that I could spin it around with the cheese fully pressurized. Then I released pressure and removed the tub. As you can see in the above picture, the two mash bags flattened right out. The string tie held nicely. I removed the string and opened up the bag. That “pomace” (the proper term for squeezed out mash) is really dry, and that is the desired goal. Here is another picture of the pomace cake in the bottom bag and some of the crumbly-textured pomace. As for yield, the half bushel of apples produced 1-1/2 gallons of sweet cider. Rack-and-cloth-in-tub cider pressing is far superior to any other pressing technique that I am aware of. If you make the form-from-a-plastic-pail that I show in the picture above, you can make mash bags very easily and lay up a cheese very quickly. No real skill is required. Is it as quick as just pouring a mass of apple mash into the tub? No. It might take you ten minutes to build a cheese, but the end results are worth the effort. 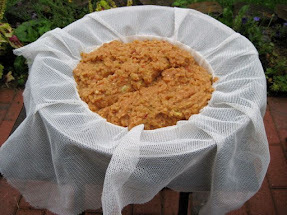 If you were pressing a lot of cider and had lots of help, someone can be making mash bags ahead so they were all ready. Then, as soon as one cheese is pressed, it would take no time at all to build the next one. The pressing fabric squares can be cleaned by giving each one a snap-shake. That will dislodge any bits of apple pomace. Then hang to dry.